Geert van der Cruijsen has developed a Windows Phone 8 emulator skin switcher, enabling developers who are using tools available to create apps and games to manipulate the look of the emulator itself. A number of smartphones are supported, as well as the different screen resolutions. 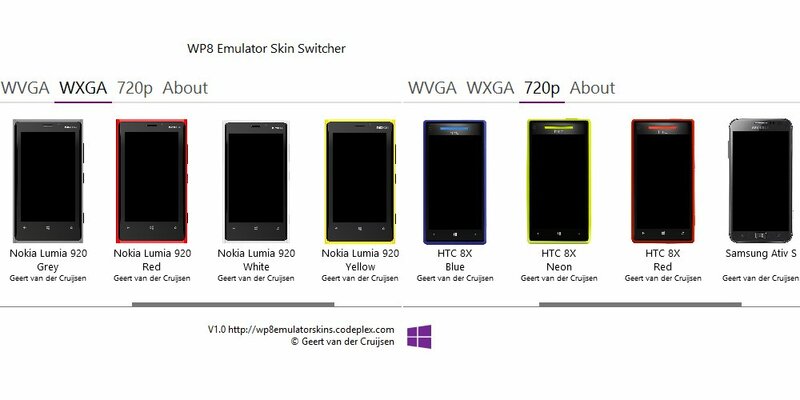 We previously looked at the emulator skin switcher for Windows Phone 7, which Cruijsen was also behind. Receiving a number of downloads and requests for a Windows Phone 8 version, we're now here reporting on a new release to cover the latest version of the mobile platform. It's perfect for those who wish to add a little spice to Windows Phone development, particularly with more unique screenshots being taken with Nokia, HTC and Samsung hardware on show. Currently on version 1.0, we're looking forward to see future updates adding more skins reflecting both announced and available hardware. Both the project and its source code are readily available for download, and installing the app is reportedly a breeze. Simply install the application once downloaded and then choose the desired skin. Restarting the emulator will then load up the chosen skin and the default emulator will now resemble a Windows Phone. Three skins can be selected at any one time (one for each resolution). Should you wish to have a skin you created implemented, be sure to hit Cruijsen up on Twitter.